Twelve people. One apartment. But so much love. This is how Tomáš Kačo described his modest childhood growing up in a small city in the Czech Republic. Kačo has played all over the world — Germany, Switzerland, Belgium, Hungary, Slovakia, Israel, New York City and Washington, D.C. — as well as at the renowned Vienna Opera Ball in Austria. He also performed for the late Czech President Václav Havel and former U.S. Secretary of State Madeleine Albright. Most recently, he found himself playing in a gallery at PEM. On a recent walk through the Ocean Liners: Glamour, Speed, and Style exhibition, a faint sound echoed through the space. It was so soft I thought I imagined it — but I followed it through the many rooms, turned the corner and found the source of this sweet, sultry jazz music. A young man in a freshly pressed tuxedo was playing on an elegant baby grand piano right on the gallery floor. And that young man was Kačo. 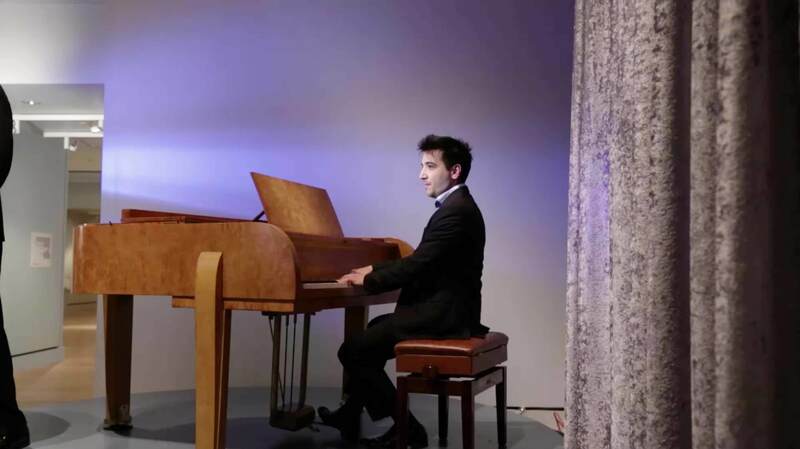 To enhance the glamorous onboard experience created for the Ocean Liners exhibition, PEM has hired a group of professional pianists to play the 1935 baby grand piano that once graced Normandie’s Deauville suite. The suite was considered one of the most important private spaces on board the French ocean liner, said Daniel Finamore, PEM’s Russell W. Knight Curator of Maritime Art and History and exhibition co-curator. It was a job posting on Berklee College of Music’s website that first caught Kačo’s eye. Not only is this his first time playing in a museum, but it’s also the first time he stepped inside PEM. But the pianist modestly blushed while admitting he still gets a little nervous before each performance. 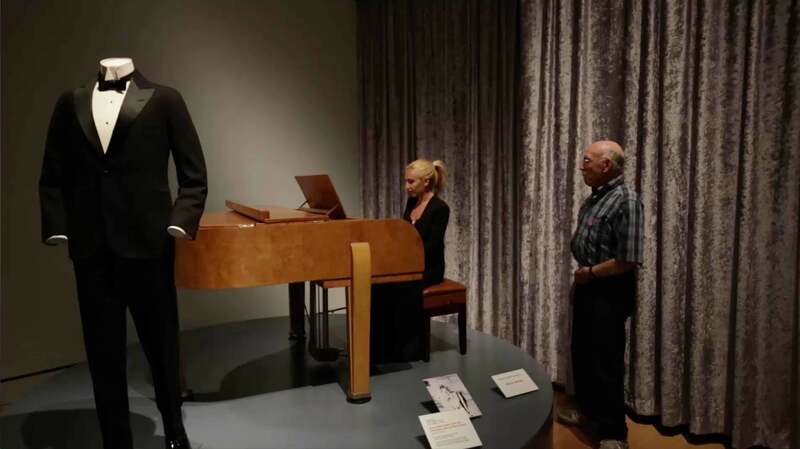 Playing songs from the Great American Songbook in a museum exhibition has proven to be an interesting experience for him. Kačo explained that singing and dancing is very much a part of Gypsy culture, and musicality is like an innate trait. As a dancer, his tales of Gypsy dancing and traditions resonated with me, and it was interesting to hear about his upbringing and culture. He said his people continue to be unfairly stereotyped but hopes to change that through his music. Growing up in one apartment, Kačo shared everything with his siblings but learned so many life lessons. He pursued his talent further and attended a music school at age 13. Learning how to read sheet music and the rules of classical piano was very much a challenge he had to overcome. But after first hearing the music of Frédéric Chopin at the age of 17, he completely fell in love with the art of classical music. But there’s more to it than that. “It’s not really about the music — it’s about the story,” he said. Every note has to have a meaning and even though you play three hours and there are millions of notes, they all intertwine to find the meaning behind each note. The longer I stayed in the exhibition, the more visitors walked past with smiles on their faces. Some began singing along to the familiar melodies, while one couple even broke into a spontaneous waltz right on the gallery floor. Come see pianists perform in the Ocean Liners: Glamour, Speed, and Style exhibition on Fridays, Saturdays and Sundays, from noon to 3 pm, through October 9. 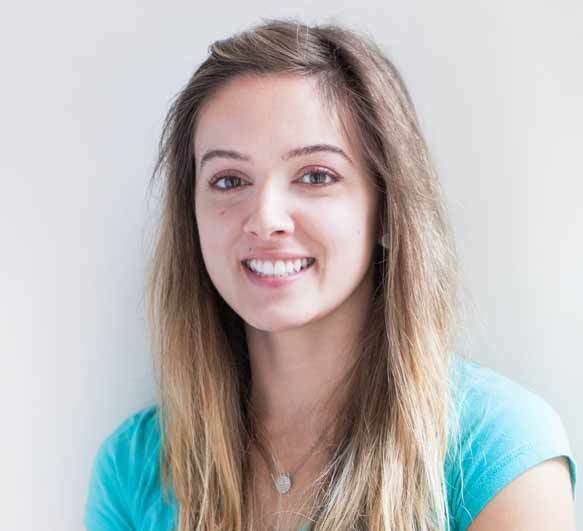 Alyse Diamantides studies public relations and graphic design at Salem State University and was the summer editorial intern for the Peabody Essex Museum’s Creative Services department. Alyse interned with Wicked Local, worked as a freelance writer for the Salem Gazette and Cape Ann Beacon and was an editor for the university newspaper, the Salem State Log. In addition to writing, Alyse enjoys drawing, painting and keeping up on the latest fashion trends.